Seated onstage at the Aladdin Theater, The Magnetic Fields rounded out two candid, rousing nights in Portland playing to a sold out house on Sunday, February 21st on their first night in town. 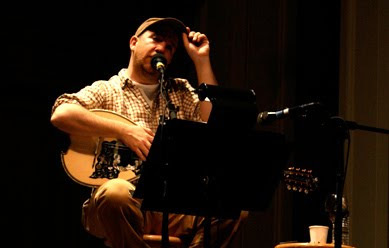 Perched upon a bar stool stage left, singer and songwriter Stephin Merritt, ukulele in hand, drearily bared himself by pairing his witty, zany craft with his remote, reserved demeanor. Between his humorlessly delivered banter (that was actually hilarious) and disconnected comportment, Merritt carried himself like a character in a Christopher Guest film, yet this was him being sincere. And that sincerity, and brevity, was what fans adored.